Home Mammals Carnivorous Mammals Are Raccoons Rodents? Raccoons are cute wild animals that belong to the order Carnivora. This mammalian order includes more than 280 mammal species including bears, seals and weasels. The animals from this order are known as Carnivores and they are distinguished by their meat-eating habits. With the help of their sharp and powerful teeth, jaws and claws, they tear away the flesh of other animals. Even though most carnivores get their nutrition from eating meat only, but there are some that also feed on plant material, like raccoons. Since they eat almost anything, it makes most of us to wonder: are raccoons rodents like rats and mice? Raccoons and rodents, both are cute wild animals but still they are quite different. Rodents are social, timid and non-aggressive animals. Raccoons, on the other hand, are mostly solitary, mischievous and often aggressive mammals. Rodents belong to a different order called Rodentia, but raccoons are classified under the order Carnivora. Consequently, on the basis of the above classification, we can safely conclude that raccoons and felines are more closely related since they both belong to the same order: Carnivora. However, rodents are classified under different order. As far as marsupials are concerned, raccoons are only distantly related to them. Moreover, the upper and lower jaws as well as the jaw muscles are very powerful in rodents. Also, the incisors of these animals are very sharp. With the help of these chisel-like blades, rodents are able to grind food or cut wood or fruit quite easily. As far as raccoons are concerned, they lack such incisors which explains why they do not rely almost entirely on meat for survival. But the teeth of raccoons are strong enough to bite off water pipes or wood. As for raccoons, they are highly adaptable and clever animals. They tend to eat a wide variety of food depending upon the season and availability of food sources in their habitat. What’s more amazing about diet of raccoons is that more than 30 percent of their diet consists of plant material. For that reason, they may not seem to classify strictly under the order Carnivora, rather they have more omnivorous dietary habits. However, the scientists have classified raccoons under this order and therefore, they are carnivores. Besides, since mother raccoon feeds its babies with milk, raccoons belong to the class Mammalia. Raccoons belong to a separate family known as Procyonidae. Some of the other members from this family are coatis, cacomistles, olingos and ringtails. Its members are called procyonids and they are mostly omnivores. The bodies of these animals are thin with long tails. The genus for the three species of raccoons is called procyon. Generally, seven species of raccoons are there around the world. Well, surely not herbivores. This is because they have this tendency to kill and eat other animals, just like other carnivores. 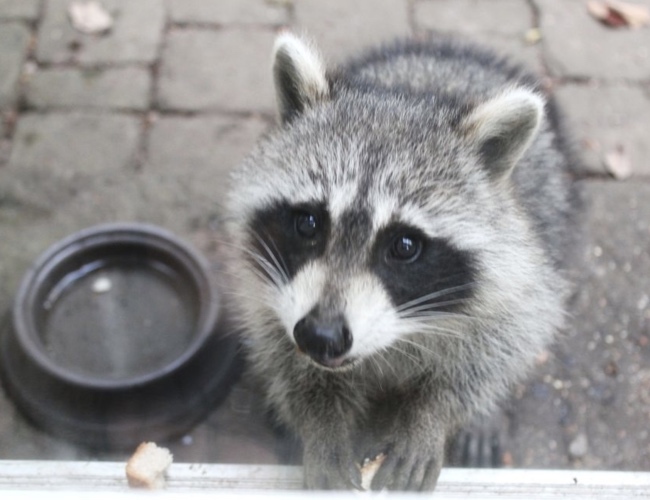 However, like most other members from its family, raccoon also have varied diet and it eats almost anything. That being said, they are carnivores by all means and they also possess carnassial teeth. Actually, the carnassial teeth of these mammals are poorly developed which is probably why they are not strictly flesh-eaters. Actually, there are two categories of the order Carnivora: catlike carnivores and doglike carnivores. Bears and raccoons are closely related because they come under the suborder of dog-like carnivores. Some of the other members of this suborder are wolves, seals, foxes and weasels. Hyenas and cats are classified as catlike carnivores. Last but not the least, one of the intriguing things about raccoons is that they can open garbage cans quite easily with the help of their thumbs.